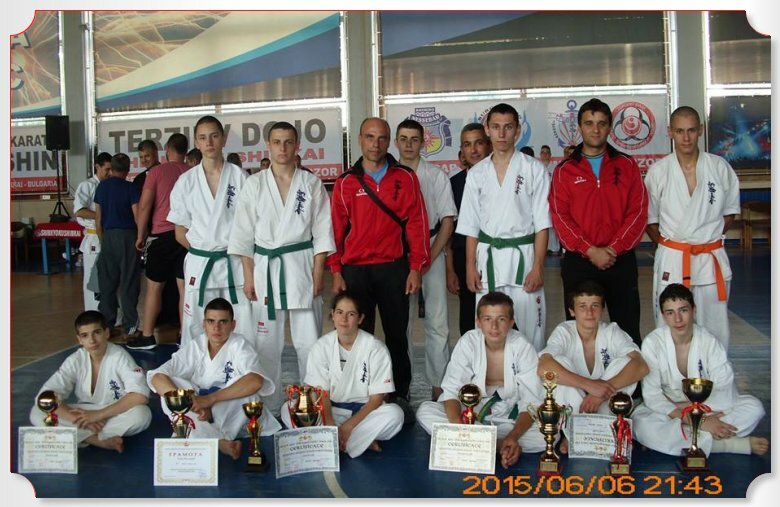 On 28.06.2015 in the "Dan Kolov" hall in Sevlievo was held the Zone competition in Shinkyokushin karate for all age groups. An excellent performance was made by the competitors of SC "Kyokushin" Shumen, who won 12 gold, 8 silver and 5 bronze medals, deservingly ending up at the top of the team standings, followed by SC "Kyokushin" Sevlievo and SC "Kyokushin" Novi Pazar. 12. Kaloian Georgiev in men. 8. Mario Vladimirov in juniors. Bronze medals were won by: Simeon Belchev, Slav Svetoslavov, Rossen Mateev, Gunai Galibov, Petar Aleksandrov. 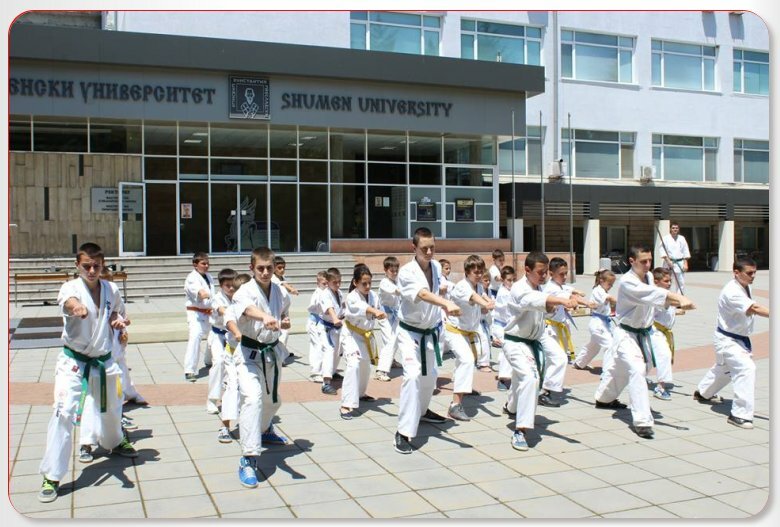 The competitors of SC "Kyokushin" Shumen were able to take part in the Zone competition thanks to the help of the Municipality of Shumen. Shumen's karatekas continue their preparation for the upcoming exam for a higher level of technique /kyu/, which will be held in July in Shumen. On 13.06.2015 at Shumen University "Episkop Konstantin Preslavski" took place a Day of Japanese Culture. The event was organized by Ms. Ukiko Tamamaru, a teacher in japanese language and culture for the Japanese association for international cultural exchange together with the Center for international collaboratio nand projects for Shumen University. The event was attended by students of the class in Japanese language and culture of ShU, children of Shumen clubs in eastern martial arts and curious citizens. Guests of the event were Ai Tsujino, teacher of Japanese iat SOU "Vasil Levski" in Russe, and teacher of Japanese at Sofia University "St. Kliment Ohridski" Yu Mitsumori. The day of Japanese culture attracted a lot of interest in building 1 of Shumen University and all guests could once again come in contact with the ancient traditions and modern culture of the Land of the Rising sun. Before the guests of the festival and students of the course in Japanese at Shumen's Alma Mater, Ai Tsujino demonstrated japanese hip-hop dancing, after which many of those present danced with her. Aleksandrina Mihailova, a tenth-grade student at Gymnasium for foreign languages "Nikola I. Vaptsarov", performend the song "Blue Bird" in japanese. The audience were captivated by the impressive demonstrations of aikido and shinkyokushin karate. Sensei Daniel Dimitrov and sensei Stoian Obretenov of SC "Kyokushin" Shumen performed "shivari", which caused a great ovation. The festival continued with a projection of animated movies, based on old japanese fairy tales, then a lesson in manga drawing (comics and caricatures), a presentation on the japanese picture theater "kamishibai" and origami, as well as a bazaar of souvenirs from the Land of the Rising Sun. 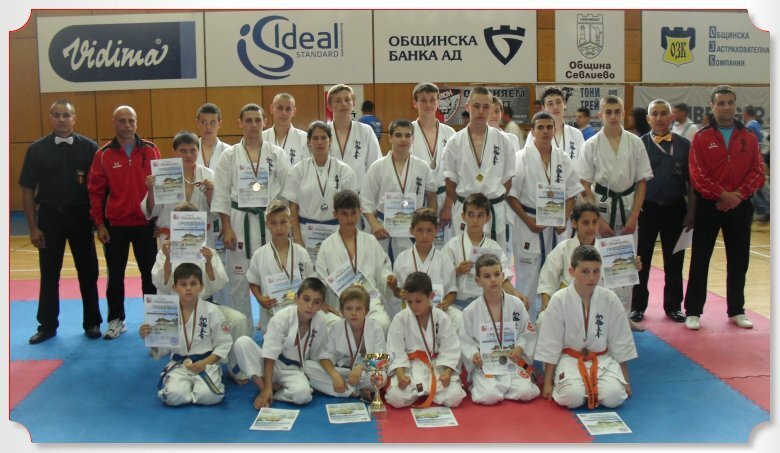 On 06.06.2015 at the "Boicho Branzov" hall in Burgas was held the International tournament for the "Black Sea" cup in Shinkyokushin karate for juniors and kadets. In the competition, which was perfectly organized by the hosts, took part many of the young hopes of the Bulgarian Shinkyokushin Karate Federation from clubs of the whole country. Among them were fighters from the National teams for juniors and kadets. An exceptionally strong performance was made by the competitors of SC "Kyokushin" Shumen, with chairman sensei Stoian Obretenov - III dan, who won 2 gold, 5 silver and 1 brozne medals. 1.Kaan Shukri in kadets 55kg, who won his semifinal by avasete ippon after some well placed hidza geri and in his final he defeated his opponent once again with hidza geri, this time by vazaari. 2.Radostin Ganchev, who made a great debut in juniors 70kg. 5.Tsvetan Urumov in kadets 50kg. The competitors of SC "Kyokushin" Shumen were able to take part in the International tournament for the "Black Sea" cup in Shinkyokushin karate for juniors and kadets thanks to the timely assistance of the Municipality of Shumen. Shumen's karatekas continue their preparation for the Zone competition in Shinkyokushin karate for all age groups, which will take place on 28.06.2015 in Sevlievo.